2019 is flying right along and now that we are getting some better weather, the busy flying season is upon us. We encourage everyone to make SAFETY the top priority every day. I'd like to remind everyone that effective communication is a key factor in maintaining a safe operating environment. We have seen our traffic numbers increase year after year. Our rapid, sustained growth can bring challenges to the traffic pattern. Whether you are in a helicopter, fixed-wing, or trying to cross a runway, effective and timely communication is the first line of defense against an incident. I have heard several accounts recently from pilots who have seen or experienced something in the pattern at KLVJ that could have been prevented with effective communication. When pilots aren't communicating during flight, bad things can happen. When pilots fly non-standard patterns or disregard radio communications, bad things can happen. When this lack of communication becomes regular, bad things WILL happen. There are standard practices in place for air-to-air radio communication and proper traffic pattern procedures. I implore everyone to familiarize themselves with these procedures and take immediate action to make sure you are always following the regulations. If you have a question about the regs, there are many resources available to help. The FAA, Houston FSDO and the incredible CFI's at KLVJ are excellent sources of information when it comes to interpreting regulations and standard procedures. We do not have a control tower and that makes individual pilots responsible for their actions and communication with others. We cannot accept last second go-arounds because taxiing traffic pulls on to the runway, or because someone is flying a non-standard pattern. Listen to your radio and clearly state your position and intentions while in KLVJ Airspace. If you are unsure about something...ASK. We are here to help each other. The system only works if we all hold each other accountable and cooperate to ensure safe, effective communication. If you have any questions, or want to continue this discussion, please stop by the FBO - we are always happy to help. I want to say thank you to everyone who works so hard, day in and day out, to make KLVJ the awesome place it is! Let's keep up the good work! Coming up in April, a "Meet the Fleet" event, introducing a new airplane in the Club and improvements to the Arrow. Lunch will be served. This is an exciting opportunity to talk directly with the airplane owners and ask them questions about their airplanes and systems. RSVP and submit questions ahead of time to safety@bayareaaeroclub.com. For more information visit their website or email. Visit the Land for Sale page on our website to download the brochure to see the reduced sale price on the remaining lots. 2019 is in full swing and KLVJ continues to grow. As we add more based aircraft, and increase our traffic numbers, I wanted to take a moment to re-introduce the KLVJ team. We see lots of new faces around the FBO every day, and we would like each of you to get to know our team! Trevor joined the KLVJ Team as a Line Service Technician in September 2016. Originally from Winnipeg, Canada, Trevor is a Military Veteran who brings a wealth of knowledge and experience to the team. He was a supervisor at Winnipeg International Airport (CYWG) at one of the busiest FBO's in North America. He managed a team of eight, pumping nearly 1 million gallons of jet fuel a month! He enjoys the community atmosphere of KLVJ and is an integral member of our team. From fuel sales to airfield repairs, he can do it all! In his spare time, Trevor likes to play computer games and challenge himself by learning programming languages, working on his truck, going sailing, visiting NASA and spending time with his two amazing Huskies- Yukon and Mackenzie. Before joining the KLVJ team in May 2014, Stephen was an Airborne Cavalry Scout in the US Army. He learned lifelong skills and takes great pride in his service to our country. When he returned from service, he began attending school in Houston. In his five years at KLVJ, Stephen has seen it all, and couldn't think of a better place to be. He makes sure that every customer leaves with a smile! Stephen has been a major factor in the improvement of KLVJ over the years. We are a small team, so he is tasked with everything including refueling aircraft, fuel quality testing, facilities maintenance, and customer service. His favorite part of the job is that every day is different! There are always new faces, different aircraft, and new challenges to keep him going. He takes pride in helping others and providing top notch service. In his spare time, Stephen likes to stay in and read books, play games, cook amazing meals, and hang out with his English Pointer Shade. I found my love of aviation and started my aviation career as a Crew Chief on the F-16 Fighting Falcons in the US Air Force. After that life-changing experience, I always looked to the skies with excitement and awe! Upon returning home, I began my civilian aviation career at Georgetown Municipal Airport (KGTU) as a Line Technician, Operations Manager and eventually the General Manager of the Georgetown Jet Center. I was the first Line Service Manager for Redbird Flight Simulations' Skyport FBO at San Marcos Regional Airport (KHYI) where I shared my love of flying by selling Redbird Full-Motion Flight Simulators to pilots, flight schools and universities all over the world. I found my way back to the flight line as the Admissions Director for the Redbird Skyport Flight School, then made the move to KLVJ as the Airport Operations Manager. I married the love of my life, Erin, on Nov. 2nd 2018, and in our spare time, we love to travel, see live music, and go camping with our dog Clara. We are a small team, but love what we do and our customers. Stop by the FBO and say hi! Don't miss the upcoming GPS Seminar (March 7) and the Annual Poker Run (March 18). For more information visit their website or email president@bayareaaeroclub.org. After a federal grant funded recent security and safety measures at Pearland Regional Airport, the facility’s management is hoping for another one to improve the facility’s infrastructure to meet aviation demands as the area population continues to surge. The facility, a privately owned airfield open to the public, also has joined local governments in lobbying to extend Pearland Parkway beyond where it dead-ends at Dixie Farm Road, which the airport’s management company, Texas Aviation Partners, says is needed to improve access from roads. Texas Aviation Partners was able to garner about $600,000 in grant funding from the Federal Aviation Agency for safety and security improvements that were completed last year and included restriping and remarking airport signage on runways and taxi ways and upgrading security gates. If awarded, the second FAA grant would go toward upgrading runway lighting and navigational aids. The company would also like to build a new terminal building. Alexander expects to to hear whether the grant is awarded by spring. TAP has joined Brazoria County and the nearby municipalities of Pearland, Friendswood and Alvin in advocating to the Houston-Galveston Area Council that the parkway be extended south. Alexander said extending the major thoroughfare would attract new businesses as well as make it easier for passengers and for businesses based on on airport property. Another reason the parkway extension is important, said Alexander, is because of the airport’s designation as a reliever airport for Hobby Airport in times of disaster such as a hurricane. He said population growth dictates that infrastructure improvements will eventually be needed at the airport. “And when is the best time to upgrade drainage and other infrastructure? During road projects,” he said. The restriping and remarking work funded last year through FAA money “make it easier for things on the plane side of things — what the pilots see from the air,” Alexander said. The airport’s gates were upgraded to be accessed through keypads. The airport is home to a variety of tenants and businesses including flights schools and airplane and helicopter maintenance shops. Built as a private facility in 1947 by Perry Brown of Friendswood, the 320-acre airport was transitioned to public use in 1950. Clover Acquisition acquired the property in 1957 and renamed it Clover Field. The airport, which has one 5,000-foot runway that can accommodate up to medium-size aircraft, was renamed Pearland Regional Airport in 2003. Texas Aviation Partners took over management in June 2013. 2018 was an excellent year for Pearland Regional Airport. We pumped a record number of gallons for both 100LL and Jet-A, traffic numbers are rising, airport-wide improvements were made, new aircraft and pilots moved to our base, and new hangars were built. The flying clubs are enjoying growth and success, maintenance shops are busy every day, and the community is coming together to keep the throttle forward on progress as we start off 2019. I am proud of all the work that has been done, and ready to see what the next year has in store. We want 2019 to be a breakout year for KLVJ. We have applied for several grants in order to continue delivering the best facilities and amenities possible. Some of the grants include LED lighting and approach indicator lights. As we continue to push forward and turn this airport into the great destination it can be, we need help from each pilot, land and business owner, visitor, and resident to keep KLVJ looking it's best and operating safely. Please read through our Airport Rules and Regulations and Airport Standards.There are plenty of opportunities around KLVJ for us to improve. Vehicle parking, boats, RVs, and old equipment are a few of the most visible and easy to correct issues that are reported to us frequently. If everyone can take a moment and pitch in, we can all contribute to safe operations in 2019 and beyond. If you notice anything that looks out of place, worn down, abandoned, etc. please bring it to our attention and we will do everything we can to fix the situation. We are committed to ensuring the best possible environment for every person, every day. Thank you for your continued support and feedback. We depend on both to continue raising the bar at KLVJ! P.S. 100LL PRICES HAVE DROPPED! New rate is $4.20 Full-Service and $3.85 at the Self-Service Terminal. Take advantage of the new lower rates and awesome weather! 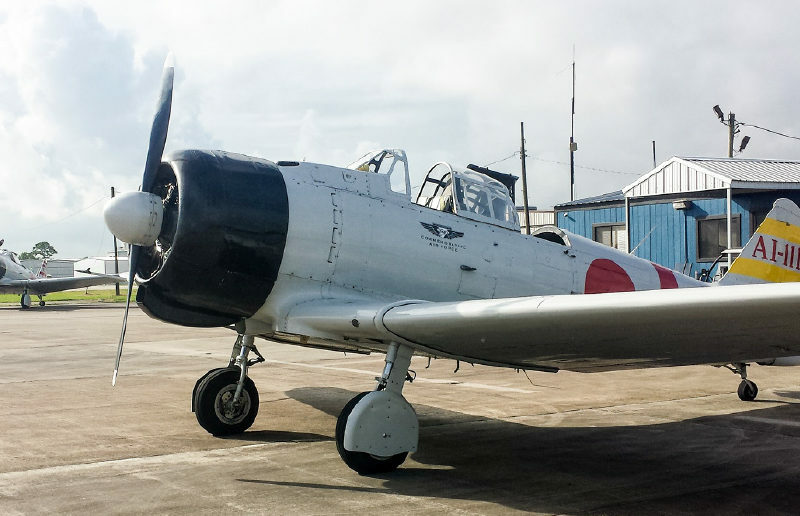 Pearland Regional Airport completed $600,000 in grant-funded safety projects in November. The Pearland Regional Airport has completed $600,000 in Federal Aviation Administration-grant-funded projects for improving safety and security, with a final inspection in mid-November. "The grant that just wrapped up is just the first step of several developments we hope to have in place here in the near future," said Stephen Alexander, owner of Texas Aviation Partners, the company managing the airport. The airport renovations came in under budget with improvements to the striping, signage, entrance gates and power lines. These improvements go a long way to make sure airplanes and cars do not mix, Alexander said. Now the airport is finishing the planning stages of development from private investors, including new hangars. "As we improve the airport and the runways and the taxiways and the airport infrastructure, it then tends to draw private development to the area," Alexander said. In 2019, the airport will hear whether it will receive a grant from the FAA and Texas Department of Transportation for lighting upgrades. Alexander said he is also hoping to see the expansion of Pearland Parkway, which could be funded by a Houston-Galveston Area Council grant. "Roadway access is one of the areas we really want to improve for the airport," Alexander said. "It's not the easiest place to find if you don't know where you're going." Adding infrastructure could increase the airport's footprint, Pearland City Manager Clay Pearson said. "The airport provides an option to private air traffic to avoid more congested and more expensive to operate airports in the area, so it's a definite niche being filled," he said. The parkway expansion would pass directly through airport property. It will also widen the two-lane road to four, creating easier access to the airport, Alexander said. "Having better access via Pearland Parkway would be a complete game-changer for accessibility of the airport and therefore driving future economic development," Alexander said. H-GAC will announce its grant funding decisions in March. The Bay Area Aero Club is expanding! They are searching for a 2 or 4 seat single engine airplane to lease back from an owner. The Club offers great incentives as part of the lease back agreement. Get your plane flying on a regular basis. Interested Aircraft Owners can contact club president, Tom Jackobs, at president@bayareaaeroclub.org. For more information on the club, visit their website. “The grant that just wrapped up is just the first step of several developments we hope to have in place here in the near future,” said Stephen Alexander, owner of Texas Aviation Partners, the company managing the airport. “As we improve the airport and the runaways and the taxiways and the airport infrastructure, it then tends to draw private development to the area,” Alexander said. Adding infrastructure could increase the airport’s footprint, Pearland City Manager Clay Pearson said. “The airport provides an option to private air traffic to avoid more congested and more expensive to operate airports in the area, so it’s a definite niche being filled,” he said. “Having better access via Pearland Parkway would be a complete game-changer for accessibility of the airport and therefore driving future economic development,” Alexander said. As the sun sets on 2018, we are thrilled to think about what a tremendously exciting and productive year we had at KLVJ! Traffic numbers are climbing and airport safety is better than ever! This year we saw many changes around our home base; new gates, new striping of the runway, taxiways and ramp area, new signage, airfield electrical improvements, and the removal of those awful overhead power lines near the FBO. New hangars were built, and we gained a significant number of new based aircraft across the field. The flying clubs are expanding and we hosted several great gatherings, safety seminars, and cookouts! We are proud of the efforts displayed by our staff to keep our loyal customers in the sky and the fuel flowing. We want to give a big THANK YOU to each and every person who flew safely this year! We will continue to make safety a top priority going into 2019 and with your help, it can be the best year this airport has ever seen. We are very happy to say we are ending the year with a drop in our 100LL pricing as well. As you are reading this newsletter, the prices across the board on Avgas have dropped $0.25/per gallon! We hope you'll take advantage of the great prices and enjoy your holiday travel. We have some big plans for 2019. We have submitted grant requests for more improvements, like LED lighting throughout the airport, including the most requested equipment - approach indicator lighting. While we are awaiting word from the top, we are hopeful that 2019 will bring productive and exciting improvements to KLVJ. All of us at Texas Aviation Partners want to wish you and your families the happiest holiday season! We want to send our heartfelt appreciation to every person who contributes to the most unique and fun airport I have ever seen. We are very lucky and grateful to have our passions and hobbies also serve as our employment, and we are just getting started. We hope this holiday season brings everyone clear skies, tailwinds, and safe flying! If you have any questions or concerns please contact the FBO at (281) 482-7551. The mission of Pilots for Patients is to provide free air transportation to those patients needing diagnosis and treatments at medical facilities not available to them locally. Their goal is to eliminate the burden of travel allowing the patient to concentrate on getting well. We have several pilots based here at KLVJ that generously donate their time and aircraft to help make a difference in the lives of others. This is a wonderful program and we are thrilled to support their efforts! Pilots for Patients is expanding their membership to facilitate the growing list of missions. They need volunteer pilots with a minimum of 250 hours experience and preferably IFR capable. If you own or have access to suitable aircraft and meet these qualifications, please consider volunteering to fly at least a single mission for them this year. By doing so you will make a huge difference in the quality of someone's life. For more information, visit their website: www.pilotsforpatients.org. All of our T-Hangars are currently leased. If you are interested on being put on our waitlist please call us at (281) 482-7551. The cold weather and holiday season have arrived. This is my favorite time of the year. As the weather becomes more challenging and the holiday travel season really takes off, we wanted to ensure everyone is putting safety first and being the best pilot they can be. Use your checklists, ask fellow pilots and staff members for assistance, lend a hand to anyone that may need it. We KLVJ-ers have always stuck together and that is one of my favorite things about our airport. Now that we have finished the TxDOT improvement projects, we are turning our focus to safety related events and learning opportunities. We have an excellent seminar approaching this weekend and we hope to see you all there. The FAA Safety Team (FAAST) and Veracity Aviation are hosting a wonderful seminar open to anyone that actively uses the Pearland Regional airport for commercial or recreational use. The meeting will go over topics such as general airport safety, helicopter operations and interactions between operators. We also aim to provide a platform for getting to know one another better and how we can make Pearland Regional Airport an ideal environment for aviation. The meeting will be held Saturday November 17 at 10am at the Veracity Aviation hangar and will have representatives from Pearland Regional, Veracity Aviation, the FAAHouston FSDO and FAASTeam. Come join your fellow aviators and sharpen your skills! Burgers, hot dogs, and drinks will be provided after the seminar. We hope to see you all there! FAA Safety Team and Veracity Aviation are partnering to host a safety meeting at KLVJ on November 17. The FAASTeam "teams up" with individuals and the aviation industry to create a unified effort against accidents and "tip" the safety culture in the right direction. This meeting is open to everyone. You can become a FAASTeam Member! A FAASTeam Member is anyone who makes a conscious effort to promote aviation safety and become part of the shift in safety culture. To become a member sign-up at www.FAASafety.gov and take part in all it has to offer. If you have any questions or concerns please contact us at (281) 482-7551. The fall flying season is just around the corner and the cooler weather will be here before we know it. It is an exciting time for all of us at KLVJ. You may have noticed big changes around the airport and a few small changes around the FBO. If you haven't stopped by recently, let me catch you up on these developments. We have finished our TxDOT Grant Improvement Project. New runway, taxiway and ramp paint, new gates, electrical infrastructure, signs, safety and security upgrades are in place and we are tremendously proud of the work that has been done. Stay tuned for information on upcoming projects. The Coastal Skies Flying Club has leased additional space in the FBO. The flying club has expanded rapidly and offers aircraft rental and flight instruction to hundreds of members. They needed additional space for their members and instructors to meet, flight plan, prep, and sign out aircraft. Club members, and those looking to sign up, can find a friendly Coastal Skies Staff member in the FBO every day. The FBO is still open and available to all pilots and passengers during business hours. You can still stop by the FBO for flight planning, coffee, restrooms, rental cars, or to request fuel from Stephen, Trevor or myself. If you have an aircraft emergency, lease issue, utility concern, or other airport related questions, you can always stop by my office for assistance. We are here to serve and proud to do so! The new gates were installed with our TxDOT improvements grant. The code for the gate has not changed, however the # sign must be be pressed first, followed by the gate code. We ask our customers and tenants to please use discretion in sharing the code. The main objective for the fence and gate system is to limit unauthorized vehicles on the ramp and around the airfield. If you need the access code, please call the office at (281) 482-7551. Please note that the FBO will be closing at 12:00pm on Friday, November 2 so that the FBO staff can attend Adam's wedding. Join us in wishing nothing but the best for Adam and his bride, Erin. This summer flying season has been one for the record books! Traffic numbers are increasing and KLVJ is a bustling, active flying community! As our growth continues, I want to take this opportunity to discuss tie-down ramp parking and vehicle parking at KLVJ. In order to maintain a safe and active ramp area, please refrain from parking your vehicles on the ramp at ALL TIMES. You can drive your vehicle to the ramp to load and unload your aircraft, but as soon as you are done, please move your vehicle to of our off-ramp parking areas adjacent to the FBO. We have noticed there are several vehicles that drive to the ramp side of the FBO and park to use the restroom or grab a cup of coffee. Please do NOT park your cars on the ramp in front of the FBO stairs. Please use the parking lots along Airfield Lane. I also need to mention tie-down aircraft parking. If you have an aircraft tied-down at KLVJ, you MUST sign a Tie-Down Agreement and pay the $75 monthly fee. We will be working diligently to ensure every aircraft has an agreement in place in the coming days. Please help us ensure a safe environment by securing your aircraft with tie-down ropes and parking brakes. We complete a tie-down aircraft inspection every morning at KLVJ and will be contacting aircraft owners to ensure agreements are in place and payments are made. Compliance and safety are two major goals for the entire KLVJ and TAP team. Please contact my office if you have any questions, or suggestions on how we can improve. Thank you for your cooperation in reaching these goals! Thank you to all the crew members for their countless hours of hard work. We sincerely appreciate each of our residents, pilots, students and businesses for their patience and cooperation throughout the improvement project. The grant project was a great success and we are thrilled to deliver new features and an improved airport experience. We are thrilled to finish this project, and will soon begin planning the next round of improvements. Please feel free to send in your thoughts, recommendations and comments for future consideration. We are building the best possible general aviation facility, and with your help, we can achieve this goal! The Bay Area Aero Club is hosting its annual Flying Skills Day on September 29, 2018 and they have great things planned. There will be delicious barbecue for lunch and it is voting day for the next board members. Come meet the candidates, other members, and show your skills. The main event will be the SPOT LANDING contest! For more information and to have your questions answered, please contact Stephen Devine via email. All pilots welcome to visit and compete. For more information visit their webpage. Come join the fun on the 29th and help elect the new BAAC Board members. As mentioned in the last newsletter, during the improvement project we were notified that the old taxiway designations did not comply with FAA regulations. Below is a map showing the updated taxiway designations. Click the image to see a larger version. New signs at every intersection should help everyone learn the new designations. If you have any questions or concerns, please give us a call at (281) 482-7551. Jim Kelley (left) receiving the FAA Master Pilot award from Lance Little. Congratulations to Jim Kelley on receiving the Wright Brothers Master Pilot Award. The Wright Brothers Master Pilot Award is the most prestigious award the FAA issues to pilots. This award is meant to recognize individuals who have exhibited professionalism, skill, and aviation expertise for at least 50 years while piloting aircraft as "Master Pilots." Thank you to Chris Kelly who sent in the photo and provided the following information about the event. "In his career, Jim Kelley flew a C130 in Vietnam, helped certify the Boeing 777 for passenger use, developed crew procedures for the new 787, helped pioneer twin engine passenger flights over the oceans (ETOPS), and assisted in establishing regular passenger flights from the US over the North Pole to the Far East (a route that saves hours of flight time). In his retirement he enjoys flying his SeaRey out of KLVJ, tennis and fishing. Special thanks to Lance Little of the FAA for coming out to present the award, Randy Wahlberg and the crew at Air Professionals for putting together the party, Jesus for the good eats, and a special recognition to Rocky Miller, who in his final days helped make this award happen." I am very excited to say that we are officially moving into the last phase of our Airport Improvement Project! Starting on Monday, August 20, crews will be on site to complete the remaining items: removal and replacement of three access gates, and underground placement of the power lines that cross Airfield Lane/taxiways near the FBO. Both projects will greatly improve our safety and security at KLVJ. Gates 1 and 3 are being replaced with new motorized gates and gate 2 will remain as is. We place a high value on securing the airport and our main gates are the key to ensuring a secure environment. The gate on CR 127 for T-Hangar access will be replaced with a motorized one as well. Our security is only as good as the weakest link and having an open manual gate 24/7 is NOT effective. A new motorized gate will be installed to strengthen our overall approach to security. Safety signage will also be added to critical points around the airport. Stop signs will be placed at every gate, in addition to signs warning drivers about the "aircraft right of way" on all roads. Additionally, "Unauthorized Vehicles Not Allowed past this point" signs will be installed to ensure that no vehicles enter areas where they do not belong. While crews are working on the gates, they will also complete the removal of the overhead power lines adjacent to the FBO. These lines will be redirected underground and improved to provide adequate and sustainable power to the various buildings along Airfield Lane. This has been one of the top items on my list for a very long time. Removing the dangerous and outdated overhead lines will make the entire area safer, and ease pilot concerns about taxiing down Airfield Lane. Safer ground ops, and the ability for helicopters to safely navigate the area, improves the quality of life for us all. This project has been a huge step forward for Pearland Regional and I appreciate everyone's efforts to help see us across the finish line! Stay tuned for more information about this, and future projects! As always, please stop by my office or give me a call if you have any questions, concerns, or great ideas. The Bay Area Aero Club is sponsoring another efficiency race. What is an efficiency race? Pilots must plan a flight, determine their time enroute and fuel burn, then fly the course. The winner is the one who gets closest to their time and fuel burn. All pilots welcome to visit and compete. For more information visit their webpage. I can say without a doubt that the last 45 days have been the busiest and most challenging time since I arrived in Pearland in the spring of 2015. I say that with a smile on my face because we welcome all challenges and thrive in a fast-paced, busy environment! The FAA/TxDOT improvement project has been a huge leap forward for KLVJ and as we near the completion of the project, I want to reflect on the changes we made, and what effect they will have on our home base. We started with removal and repainting of all ramp and taxiway area centerlines. The new black and yellow guidelines will help taxiing aircraft safely maneuver around the airport. We also did some major upgrades to our electric vault, replacing the regulators that control the airfield lighting. We increased energy efficiency and performance to all the taxiway and runway lights, as well as all signs. As we were in the planning stages of this project, we realized that the taxiway designations were not compliant with FAA Regulations, so we began the process of redesignating the old taxiways B, C, and D. We installed all new signs along the entire runway and each taxiway. The new designations are in effect and can be seen clearly in all directions. This will help all pilots safely navigate KLVJ's movement areas. Each of these improvements were designed to increase our compliance and safety standards at KLVJ! We removed and repainted all the Runway 14/32 markings and we had to moved the hold short markings further from the runway to comply with FAA regulations. This was the most challenging period during our renovations. Coordinating the closure of the runway, monitoring construction crews, and dealing with the weather was a daunting task. I want to thank everyone for their support and assistance during this period. We achieved our goal of revitalizing our runway to improve safety for all pilots, students, and instructors. We have a few items that are still in the works as of this newsletter release. We will be replacing all three main entrance gates to the airport and removing the overhead power lines that cross Airfield Lane by the FBO and moving them underground. These are two major safety improvements that we have needed for some time. We will be working on these final items in the coming weeks and we are all excited to have everything completed soon. Please stay tuned for more updates as we progress. As always, if you have any questions please stop by my office or give us a call. As mentioned above, during the improvement project we were notified that the old taxiway designations did not comply with FAA regulations. I am sure you have noticed the crews working around the clock to complete our airport improvement project. I want to thank everyone who has contributed to the project, and especially our customers and tenants who have been patient and understanding of the challenges this project presents. We completed paint removal and re-striping across all ramp and taxiway areas, ahead of schedule. Crews are currently making upgrades to our electrical vault and will be replacing the access gates at each entrance. The runway is currently CLOSED for paint removal and re-striping with an anticipated reopen date of June 20. We are keeping a close eye on the weather and will make every effort to alert users of an extended runway closure, if necessary, as soon as possible. I understand this is an inconvenience for every pilot and business on the field, and all the KLVJ staff thank you again for your cooperation. We're confident in the end you'll be pleased with the results. During a recent progress update meeting, we were notified that the old taxiway designations did not comply with FAA regulations. The scope of this project triggers the requirement of compliance, therefore some taxiways will be renamed. New signs at every intersection should help everyone learn the new designations. We will continue to send out updates regularly throughout the remainder of the project and as always feel free to call your friendly KLVJ staff members with any questions you may have. Be sure to check NOTAMs daily until project completion. Pearland Regional has been exploding with growth and activity, and these improvements will help increase safety and security as we grow. We are always striving for the best KLVJ experience, and this is a huge step forward. Thank you again for your attention to these details and your cooperation with KLVJ, TxDOT, and FAA crewmembers. Great turnout for the 2018 Bay Area Aero Club Poker Run back in May. The warm weather and busy flying season are in full effect and as always, we encourage everyone to make safety the top priority each and every day. I'd like to remind everyone that effective communication is a key factor in maintaining a safe operating environment. We have seen our traffic numbers increase year after year. Our rapid, sustained growth can bring challenges to the traffic pattern. Whether you are in a helicopter, fixed-wing or trying to cross a runway, effective and timely communication is the first line of defense against any incident. I have experienced what can happen when two pilots aren't communicating during flight. I've seen a fixed wing aircraft pass a few feet over a helicopter already on the runway preparing for takeoff. I have seen vehicles and aircraft cross the runways with pilots on short final approach. I have witnessed countless go-arounds because one of the pilots in the pattern isn't using their radio. These examples are real and could be totally avoided by simple and direct communication between pilots. We do not have a control tower here at KLVJ and that makes each individual pilot responsible for their actions and communication with others. No one prefers a last second go-around because taxiing traffic pulls out on to the runway, or because someone is using the wrong end of 14/32. Listen to your radio and clearly state your position and intentions while in KLVJ Airspace. If you are unsure about something...ASK. We are here to help each other. The system only works if we all hold each other accountable and work as a team to ensure safe, effective communication. If you have any questions, or want to continue this discussion, please stop by the FBO - we are always happy to help. I want to say thank you to everyone who works so hard, day in and day out, to make KLVJ the awesome place it is! Let's keep up the good work! Construction associated with the FAA grant for security and safety improvements started Monday, May 21. Throughout the course of the project, we will send frequent updates about construction locations and associated closures and will include detailed maps (click the links below to view the maps). We will work closely with the engineer, contractor, and inspector to minimize disruptions as best we can. Below you'll find an overview of the project. The dates listed are subject to change based on weather. Throughout the entire project, crews will be working on electrical and will be replacing gates and signs outside of the Runway Safety Area (RSA). We anticipate the entire project will wrap up by Wednesday, July 4. During construction, if you have any questions or concerns, please give us a call at (281) 482-7551. This grant project is administered by TxDOT Aviation, engineered by RSP Klotz, and the contractor is Airfield Western. We will be able to pass along issues to the appropriate person and attempt to answer your questions as expeditiously as possible. I'd like to start off by saying Thank You to each and every person that helped KLVJ achieve our busiest March on record. It shows just how dedicated you are to General Aviation, and it is a great indicator for the rest of our year. It sure is a tremendous feeling to see so many faces, old and new, around the airport every single day! With the busy flying season upon us, I want to spend a moment reviewing airport safety, and addressing one issue in particular that I get asked about often: airport parking. As our based aircraft count rises, and the number of flying students, instructors, and visitors grow, we need to all do our part to maintain a safe and efficient environment. Aircraft and vehicle parking are a big area of concern for the airport. Below are a few bullet points that will help the taxiway and ramp areas stay open and clear of obstructions. Airfield Lane is both a taxiway and roadway - not a parking lot. Do not park on, or in the grass areas near Airfield Lane at any time. Vehicles can be parked at the FBO office, FBO Hangar overflow parking, or the grass field on the south side of the FBO (long term parking). Taxiing aircraft ALWAYS have the right-of-way. Ensure your aircraft or vehicle remains clear of movement areas when parked. Aircraft that are being towed, repositioned, or moved in/out of a hangar are not to be parked on the taxiways for an extended period. We ask that you do your best to quickly move aircraft and clear the taxiways as soon as possible. Placing a traffic cone by the wing is a great short-term safety net - but it does not effectively make that a parking spot. There are more than enough tie-down spots on our ramp to accommodate any overflow aircraft. When parking any aircraft, personal vehicle, or equipment at the airport, please remember, there is no parking within 25 feet of the taxiway centerline to maintain clearance for taxiing aircraft. If you are unsure of where to park your vehicle or aircraft at KLVJ, swing by the FBO and we will be happy to assist you. This is one small way we can all contribute to the safety and efficiency of our home base. As always, my door is open to discuss this or any other way we can continue to improve. Thank you for all you do to keep us flying! Construction covered under the grant from the FAA for security and safety improvements is set to begin at the end of May/early June. As we get closure to the start of construction, please stay tuned for more information regarding work. We will be sending out special bulletins regarding the construction schedule, closures, and NOTAMS as the details are finalized. Would this guy be considered FOD? One of the things that truly separates KLVJ from most other airports I have encountered are the people, and the way we all strive to work together. We have a community like no other! Day or night, rain or shine, we can depend on each other to help maintain safe flying, remedy problems, and promote a tremendously positive aviation atmosphere! I want to share with everyone an upcoming opportunity provided by our friends at Coastal Skies Flying Club and Total Aircraft Services. On April 7 they will be hosting an FAA basic medical clinic from 12pm-6pm at the Total Aircraft Services Hangar. More details are shared in the article below. I encourage everyone to take advantage of this great chance to complete your medical requirements and spend a day visiting with other pilots and instructors at KLVJ. These types of events are key in maintaining a safe and effective environment! There are countless chances to learn new skills, reach another milestone, or help someone else discover and unlock their potential in aviation. I'd like to thank each member of our community for always going above and beyond to look out for each other and provide opportunities for success! Coastal Skies Flying Club and Total Aircraft Services is hosting a FAA basic medical clinic on April 7 from 12pm-6pm at the Total Aircraft Services Hangar, 17910 Airfield Lane. You can save time and schedule an appointment by calling (281) 338-2006. Dr. Ping Chu is a pilot friendly physician with 25 years in the medical field. He will conduct Basic Medical Exams at KLVJ to help pilots stay current with regulations. The cost is $100 (cash or check) and the Basic Medical is good for 4 years (check with AOPA about your medical requirements). You must have held an FAA Medical Certificate within the last 10 years to use the new Basic Medical. In addition to our move-in special, we are also offer a pre-payment discount: prepay 11 months and get the 12th month free! For more information call (281) 482-7551. Fuel safety is our primary concern each and every day at KLVJ. We take extensive measures to ensure each gallon of fuel at KLVJ is received, stored, and dispensed properly. Our staff of NATA Certified Professional Line Service Technicians are well trained and equipped to handle this immense responsibility. I'd like to share with you a few of the ways we safeguard against any potential dangers. Before the FBO opens at 8am each day, our staff is on the ground inspecting fuel samples and conducting quality checks. We inspect each tank and truck top to bottom, then collect and record fuel samples from every fueling port, tank drain, and filter sump. We have routine daily, monthly, quarterly, and annual checks that help us stay in control of the highest quality fuel standards. February is our annual inspection month and I am proud to say that once again we have successfully completed our inspections on all storage tanks and trucks for 2018. Each meter has been recalibrated for precision, and all filtering elements have been changed. Our fuel farm is in great working condition and ready to continue fueling the tremendous growth at KLVJ. I want to thank our staff for their dedication and hard work. They dutifully put in the hours, day after day, to maintain our standards and provide excellent service. We will always strive to uphold the highest industry quality standards, and if you would like to know more, feel free to give me a call and I can answer any questions you may have. We are looking forward to a fantastic, busy flying season for 2018! As of February 1, the $0.10 based tenant discount on full-service 100LL is no longer available. In an effort to continue offering affordable fuel, we have lowered the price of self-service 100LL for all customers looking for a more economical way to fill up. For current fuel prices, please check AirNav.com regularly. Shared from our friends at Air Professionals, an unconventional aircraft at LVJ. The latest Pearland Regional Airport was awarded a state grant that will begin and end in 2018. This grant will allow for safety and security updates to the airport. Pearland Regional is a reliever airport for William B. Hobby Airport in Houston. While the Pearland airport has existed since the 1950s, Texas Aviation Partners took over in late 2013. According to Texas Aviation Partners co-owner Stephen Alexander, changes to drainage have been made since then. This allowed aircraft from the airport to fly supplies out during Hurricane Harvey. The airport was annexed into the city during the Pearland City Council meeting that was held Nov. 27. The airport has also added new hangars, remodeled the terminal building and added full-service concierge-level amenities, including rental cars, flight planning and assistance with hotel accommodations since 2015. What’s next The Texas Department of Transportation grant will allow for a number of safety and security updates, including new gates, lighting upgrades and airport striping and marking. The airport has four gates, all of which will be evaluated. Some of the gates may be replaced after the evaluation. These safety and security precautions will affect both the flying and driving public. Increased signage as well as repairs to the gates will discourage drivers from mistakenly driving onto a runway. This story is one update from The January Issue. View the full list of Top 5 stories to follow in 2018 here.